Point Judith Fishing Charters on a Light Tackle Boat - Galilee Fishing Charters and Charter Boats Rhode Island. 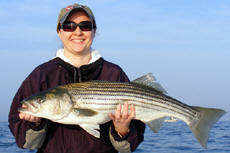 Enjoy light tackle Point Judith charters for stripers, bluefish, flounder or tautog, because It's Fishing Time! 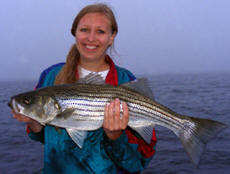 Next time you visit Rhode Island during the summer consider a fishing trip with Its Fishing Time Charters. Your trip with Its Fishing Time will be both entertaining and very productive, targeting any of the popular species of fish we have here in the ocean state. From the northern part of Narragansett bay to the south side of Block Island Island, these waters are very rich with striped bass, bluefish, flounder, sea bass and many other gamefish species. A fishing trip is a great activity for the family when on vacation, a father and son, or a group of dedicated anglers looking to have a great time catching fish in our unmatched striped bass fishery here in Rhode Island. We are among the charter boats that are closest to the famous Block Island fishery where many stripers and blues are caught every year. Trips can be half day, three-quarter day, or full day affairs, depending on how much time you want on the water. Usually half day trips can get the job done at the peak of the season, but during the slow times a three quarter day trip may be necessary for success. We can target a variety of species and it is possible to target more than one on a given trip. Some of the species we fish for are striped bass, bluefish, tautog, sea bass, scup, flounder, and tuna. The charter boat is a 35' Down East vessel with a huge cockpit area providing a plenty of fishing room for the clients. The hull provides an excellent ride in most chop conditions found out on Block Island Sound during the summer months. A depth finder, GPS chart plotter, and radio are installed. If its a foggy day, we also have radar. We take a MAXIMUM of 6 passengers. Before your trip get a full night's rest. If you tend to get sick, take no-doze Dramamine or Bonnine at least an hour before you get on the boat. Don't drink alcohol prior to sailing.